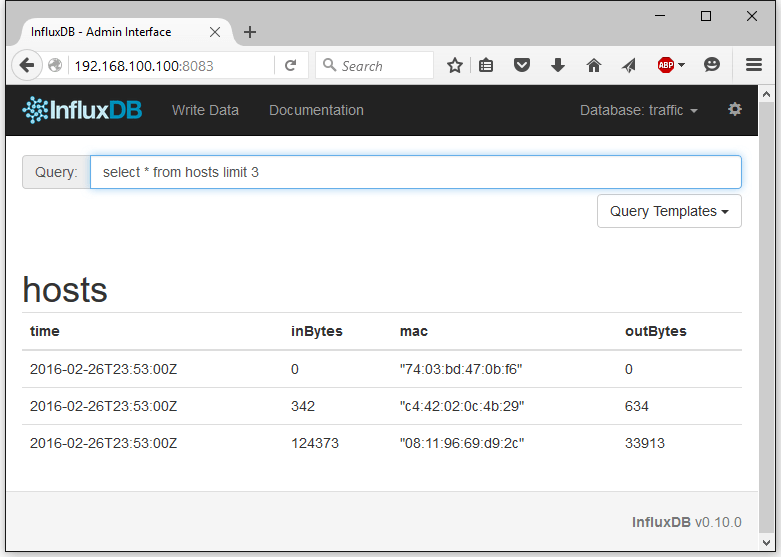 InfluxDB is a time series database. This means it is specialized in collecting, storing and querying sequences of measurements over a time interval. It is great doing this job, and since it’s exactly the job that we need, we’re going to use it. If you prefer to add a PPA to your repository list, follow these instructions instead. Now we need to populate the database with time based data. First we need to create a script that will run in the DD-WRT enabled router that will let us gather statistics from every device in the same LAN the router is. The idea is that per every device in your LAN the script will create two entries in a new chain in the enabled router’s iptables, one for incoming packets, and another one for outgoing packets, both with target RETURN, so it returns to the original chain. Then in the FORWARD chain we are going to send to the RRDIPT chain every single packet there, the RRDIPT chain will count the packet, and then will return to the FORWARD chain. You can find my complete script here. By the way this was not my idea. This is all based in a script called wrtbwmon. This script has to run every minute in the router’s cron to gather statistics and every hour or so to detect new devices in your LAN. 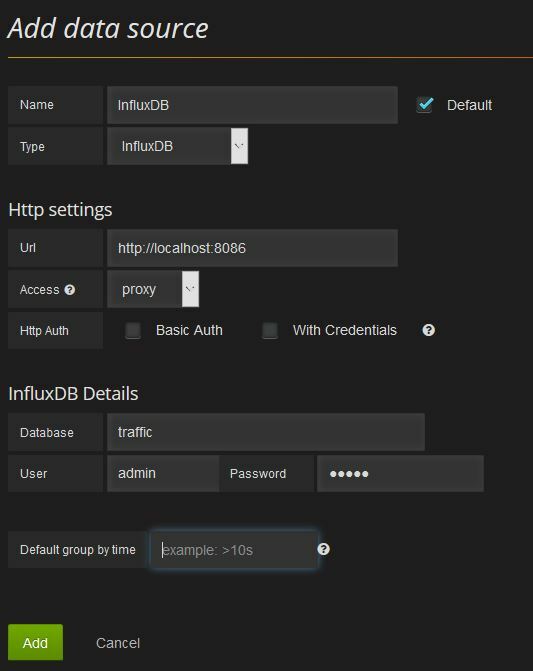 Also remember to change the DBURL environment variable with the URL of your InfluxDB database in your LAN. To do this you have a couple of choices depending on if you can enable JFFS or not in your router. If your router has enough memory then you can enable JFFS. Follow the instruction on how to enable JFFS in your DD-WRT enabled router first and copy the script in /jffs/bin and name it trafficmon (no extension). Remember to give the script execution permissions (chmod +x trafficmon). Don’ t forget to give execution permission to the startup script (chmod +x trafficmon.startup). Everything looks great! Now we just need to create graphs for this data. If everything went well you can login at http://localhost:3000. The default login and password are admin. 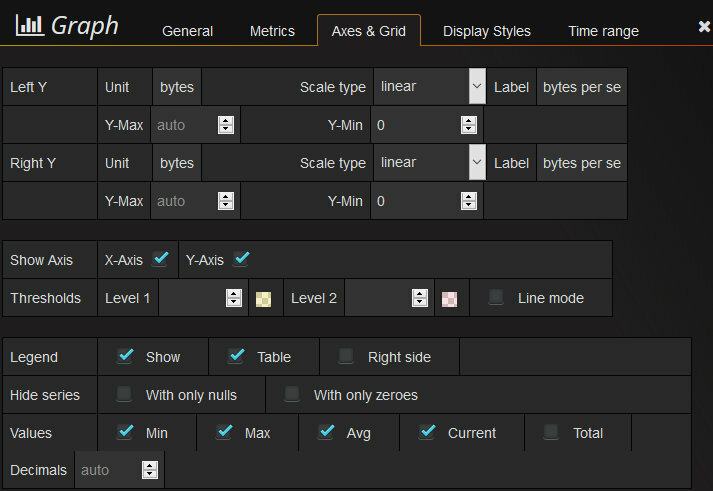 Let’s configure our InfluxDB as a data source in Grafana. Go to Data Sources and click on New. Fill the form with a name for your InfluxDB database (I used “InfluxDB”) and select InfluxDB as Type. 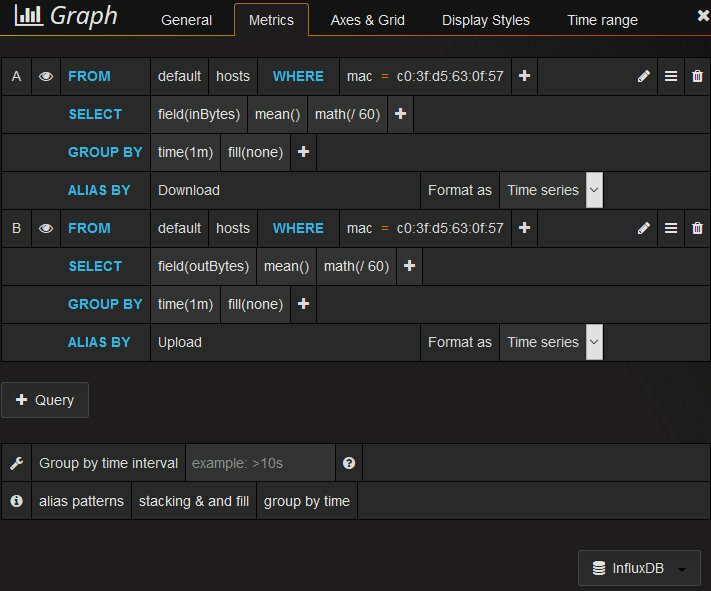 If Grafana and InfluxDB are running in the same server, the URL should be http://localhost:8086. We named our InfluxDB database “traffic” and just type anything in the user and password fields. Those are not used but if they are empty Grafana won’t let you go on. Click on Add and we are ready to create some graphs. Create a new Dashboard clicking on Home and then New and then add a new graph clicking in the green icon at your left (that’s the menu of the row) and then on Add Panel and then Graph. Select InfluxDB as your query type and then add two queries (one for the downstream and another one for the upstream of the host you want to create the graph for). As you can see since we are collecting data every minute but we want to show bytes per second, we have to divide the average (the mean) by 60. Do this for every device in your home or office and that’s it! If you want a graph with all the traffic select the MAC address 00:00:00:00:00:00. This entry was posted in dd-wrt and tagged Grafana, InfluxDB. Bookmark the permalink. I followed your guide to the letter, and I am getting stats on the 00:00 MAC address, so I know the script and cron are working on my router(R7000). However I’m not getting any network stats for all the other MAC addresses of my various devices. They all show as 0 in InfluxDB. Can you provide any insight? Thanks! You can also try to run the command manually in your router (/jffs/bin/traficmon/setup) to recreate the individual hosts rules. Same here – getting all traffic on 00:00. Also using an R7000. Tried running setup script both with cron and manually to no avail. I /am/ able to see individual MAC addresses in InfluxDB, but everything besides 00:00 has a zero value. Are you able to see all the IP addresses in your network with meaningful values on pkts and bytes columns? Or just replace the script with the new one in the link. What is MAC address 00:00:00:00:00:00? It seems to be working on all the other MAC addresses on my network but then i get random data on 00. I thought this would be the total but its way less then my top user. My top user had 40gb yesterday and 00 had 2.8. Also, RRDIPT2 checks for from br0 to eth1 and from eth1 to br0. Maybe your router is different? Check what are the interfaces for LAN and for WAN in your router. In my case (and the case of the script) eth1 is WAN (it has the WAN IP address assigned) and br0 is LAN (it has the LAN IP address). Maybe you have a different router where DD-WRT assigns different interfaces for WAN and LAN. But you should double check they are the correct interfaces. Ya i see now that 00:00:: is inverted. The issue i am now having is that I have 3 LAN interfaces Its working for my wired but not counting for wireless. I have eth0, ATH0, and ATH1 on my LAN. eth1 is my WAN. Disregard. I was connecting in a weird VPN loop by accident. Its all working now. This is a great script, but I was curious if its counting loop back bytes. I mean, A device on my network seems to route to the modem and then back to the internal device. They are both wired devices, but I think the software on the machine is targeting the wan IP which then loops back in. If this is the case, is there a way to not count those values? Well, I am utterly stuck, and hoping someone is able to help. I had been using the script successfully for a long time, but I upgrading my router this weekend. Running an Asus ac3100. Switched firmware to AsusWRT-Merlin because I need to be able to schedule jobs in cron for this script. The problem is a little hard to identify because everything LOOKS right, it’s just that the packets and bytes are MUCH lower than expected. WAN traffic is eth0. Note that I had to modify script to WAN_IFNAME=$(nvram get wan_ifnames) to get it to return a value. wan_ifname key didn’t exist. Here’s some of my iptables. Everything seems right, just the values are really small. ANy clue on what else I can look at? Thanks a ton – had been a really great script for Influxdb + Grafana! Are you saying that your numbers are low? Well I can say that the script heavily depends on running trafficmon update every minute. If you changed your cron and somehow the script runs every 5 minutes or whatever, it will give lower numbers. Well. When there is heavy traffic.. it seems to my capture some of it. Low traffic seems to be ok. heavy traffic my be 100 megabit or more sustained. The built in ddwrt counters however are correct. I was curious if the collection of the values followed by the clearing of the statistics was long enough in time to create missed bytes. I think my collection method is every second or every couple seconds. Maybe if I move that to once per minute it would be more accurate. Working great here for a solid year. Question, though. I’ve recently started an OpenVPN server on my Asus-WRT router. That traffic seems to be on iface tap22 which is then bridged to vlan1 on br0. So the global file looks right (4 records, two for WAN total and two for VPN totals) but the VPN traffic is always 0. Do I need to go into EBTABLESinstead of IPTABLES to solve this? I was probably overthinking. A simple bash script and pulling the transferred bytes from /sys/class/net/tap22/statistics/rx_bytes and /sys/class/net/tap22/statistics/tx_bytes worked well. Make sure the files /jffs/bin/INPREV andf /jffs/bin/OUTPREV exist and have a baseline. Next run the script does simple subtraction and updates the current values into the previous stored files. Note that a reverse the in/out for posting to influx. I did this to match the totals from 00:00:00:00:00:00. When someone outside my house vpns in, if that person downloads it’s an upload from my perspective (and my ISPs persepctive). I store the values against mac 00:00:00:00:00:01 for the VPN. I believe I tried br0tap22 (LAN bridge to OpenVPN) as above, as well as vlan1tap22 (LAN to OpenVPN) and tap22eth0 (OpenVPN to WAN). All show 0 traffic even though ifconfig shows increasing traffic values on the tap22 interface.